Srirama, lying on Dharba(Dry twigs) requested for Samudrarjan to make way for the construction of bridge to retrieve Sita from Lanka - hence people worship him here as Dharbasayana Rama. In this temple Lakshmana is serving(doing kainkarya). 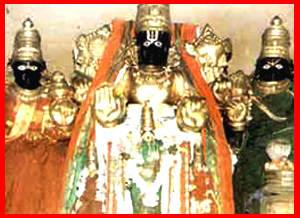 Rama can be seen as Aadisesha and in Pattabhisheka Sannidhi He is in the traditional form. The Lord presented Himself under the Ashwwattha tree to pullva Maharishi here, pleased with his Ashtakshara Japa and hence this place is called Pullaranya. Sethusnan is considered to be very auspicious. Rameshwaram is nearby and Danushkoti, washed away in cyclone and floods, was near this place. Two Thaayaars - Kalyaanavalli, Padmaasani. Theertham - Hema Theertham, Chakra Theertham, Rathnaakara Sea. Thirumangaialwar - 1768-1787, 2674 (131). Access to the temple About 6 miles from Ramanathapuram Station(Madurai - Dhanushkodi Line). The moolavar of this sthalam is Kalyana Jagannathan. He is found in Nindra thirukkolam facing along the East direction. Prathyaksham for Ashwantha Narayanan, Pullaranya Rishi, and Samuthira Rajan, Devalar Muni and Kanva Maharishi. Thaayar: There are two thaayars found in this sthalam. Kalyana valli is one of the thaayar and another one is Padmasini thaayar. This is one of the divyadesam which is found in Ramanathapuram district, in Tamil Nadu. We can reach this sthalam while travelling along Keezhakkarai. We can reach this sthalam by getting down in Manamadurai railway station and take a bus to reach Thiruppullani. But there is no plenty of lodging facilities available.